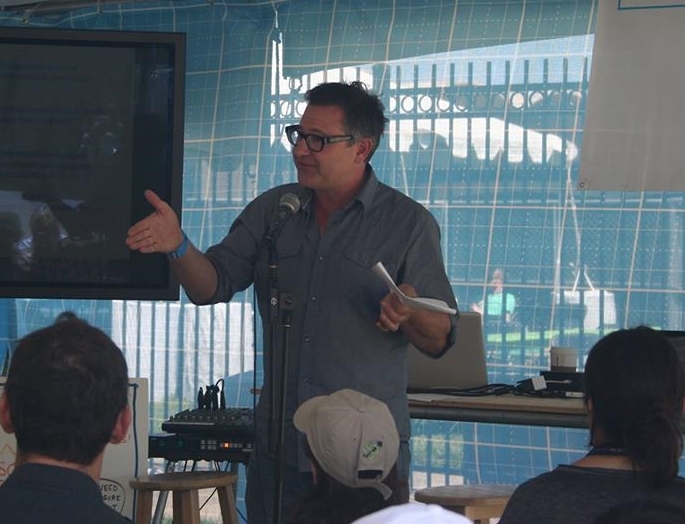 Speaking to teachers and educators at the Maker Faire Education Tent. After Matthew graduated from the California College of the Arts with a degree in design, he dove head first into work as a branding designer/art director in firms large and small throughout the San Francisco Bay Area, working with brands such as Keen Shoes and Hewlett Packard. After almost 10 years in the industry Matthew became interested in taking what he had learned in school and as a professional designer and apply that wealth of experience to education. In 2006 Matthew started researching and designing programs to foster kids instinctual sense of creativity and problem solving. Over the course of the past few years he has developed several after-school and enrichment classes that are currently in place, throughout Bay Area in schools, various educational organizations, and training teachers to lead them. They have been so successful, that he has since expanded the programs and workshops to include adults groups and corporate clients. Matthew has appeared numerous times at the Maker Faire and speaks often in university classrooms such as Mills College in Oakland, The California College of the Arts in San Francisco, The Boys and Girls Club, San Francisco's Children's Creativity Museum, and the KALA Art Institute. Matthew continues to work onsite with private and public teaching programs in the Bay Area as well as home-school groups. Matthew also teaches classes in creative process and thinking at the Academy of Art University in San Francisco.